When you have to host a site on any shared server, a commonly asked question is whether having a shared IP address will work just as well as a dedicated IP address. The IP address refers to a unique address which is assigned to computers when connected to a specific network. So, The Internet Protocol or IP basically serves as the distinctive feature which is used for identifying valid locations of computers on any given network. In shared hosting, there is a single physical server and its resources are collectively shared by multiple users. So, the IP address here will also be shared by multiple co-users residing on the same platform. In comparison, in dedicated hosting, every site will have a definite IP address that belongs to this account exclusively; it will not be shared by any other neighboring site. This explains why it is beneficial to own a dedicated IP address. 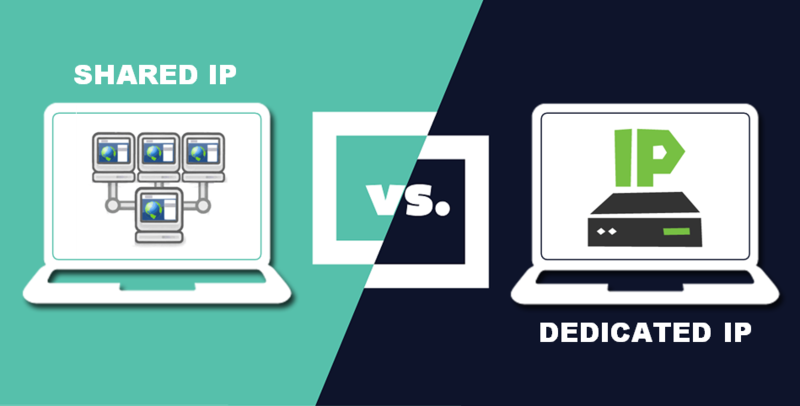 How is a dedicated IP address more useful than a shared IP address? A shared IP address as the name suggests will be shared by more than one website; so it is a single address employed by multiple sites within a single server. A dedicated IP address is where the site has its own address that it does not have to share with others; you can simply make use of this address to access the site from your web browser. • Having a dedicated IP address is beneficial because it allows you to access servers directly without changing the DNS settings for their domain names. This feature may prove to be useful especially when you want to preview how a site will appear before you actually launch it on the Internet. • When you have a dedicated IP address, it helps to add more credibility to the reputation of the email sender. When you have only one IP address being shared by many users at the same time, it may lead to operational difficulties which can even affect the email delivery services. For instance, a neighboring site can get blacklisted as a spam website thereby affecting your reputation and your email services. With a unique IP address, this problem is not likely to surface and your site’s reputation or functions will not be affected by other sites on the same server. • A unique IP address helps to build your brand image and identity. This is particularly necessary when you must create your own commerce online store. Without a dedicated IP address you cannot get SSL certificates for your site which will guarantee security and confidentiality of your customer’s financial information. So, even online shoppers will be driven to make more purchases on your site when they see that you have a distinct IP address. • There may also be times when certain scripts and applications require a dedicated IP address for installation. This explains why a dedicated IP address is always preferred to a shared IP address. • When you have a dedicated IP address you can avoid incompatibility issues which often arise with shared IP addresses. Today, it is possible to install multiple SSL certificates using shared IP addresses but this may cause problems with the earlier versions of some browsers and the viewers are greeted with messages showing “untrusted connection”. • You will also need a dedicated IP address when you want your site’s performance to improve. You will be able to enjoy better and faster handling of incoming traffic to your website, lengthier timeouts for the long-running applications, increased protection when shared IPs get attacked by DDoS which may lead to overloading of traffic to disable a server. With dedicated IP addresses, the risks of emails getting bounced back because a server was unavailable or viewers being unable to access a site are eliminated. A dedicated IP address will ensure that although there may be many other targeted IPs on a server with traffic filtering measures , this will never affect your emails and sites and you can continue running your business as usual.